Now, in fact, we already live largely in a negationist society. No event is ‘real’ any longer. Terror attacks, trials, wars, corruption, opinion polls – there’s nothing now that isn’t rigged or undecidable. Government, the authorities and institutions are the first victims of this fall from grace of the principles of truth and reality. Incredulity rages. The conspiracy theory merely adds a somewhat burlesque episode to this mental destabilization. Hence this urgent need to combat this creeping negationist and at all costs, safeguards a reality that is now kept alive on a drip. Humans constantly learn how do things, how to explain phenomena, how to model the world: how to minimize the difference between expectation and observation. 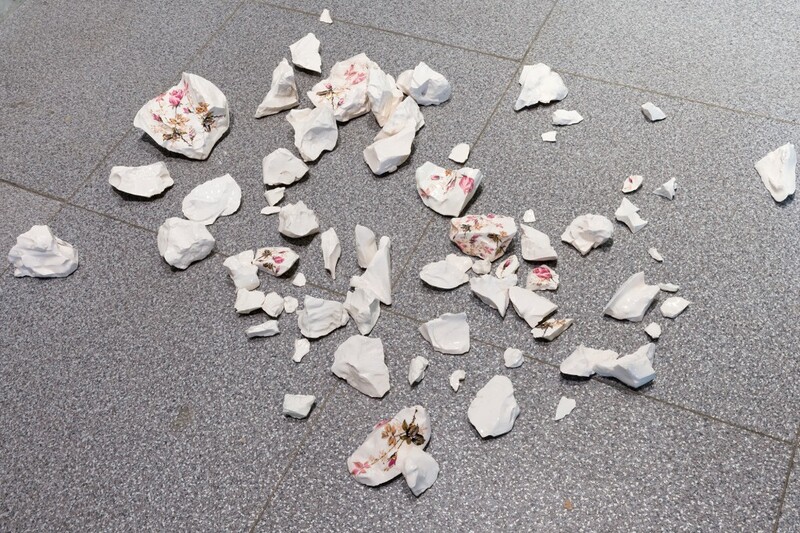 To that end, not only learning from success has proven useful, but also learning from failures, realizing when it is time to give up trying something: Repeated failure frustrates us, the pain incurred by failed attempts undermines our self-esteem. We feel powerless and embarrassed in the face of an overwhelming difficulty. And eventually we give up. It is a sign of intelligence to do so; we have learned that something is impossible. The insight of impossibility gets encoded in an emotion, especially if punishment or pain is associated with a failed attempt. This internalized experience of incapability is often so traumatic that we never ever take another attempt, even if the conditions may have changed. We do not even take notice of them any longer. Even if all obstacles get removed: We don’t try anymore. We have given up. We have learned helplessness. Humans learn not only from own experiences, but also by observing the successes and failures of their peers. There are numerous narrative forms for passing on frustrations, there is a tone reserved in every social group’s repertoire of jokes, sighs and lamentos for expressing it. We pat our shoulders and agree that it simply could not be done: We learn the helplessness of our ancestors and peers. Moreover, the future can only be made from what is considered possible: We can only choose among the options for behaviour that we are aware of. Many of the possibilities that our ancestors have gotten frustrated with never become part of our world. They get buried on the cemetery of failed attempts, and pride and pain prevents the ancestors from telling stories about them. Especially when some attempt gets punished by psychological or physical violence, then the emotion that encodes the failure is not just frustration, but a deep injury of the soul: apathy, depression and despair are what the victim will suffer. Human emotions are the material of which power is forged. A plethora of elaborate techniques exist to plant and dung them, stake or trim, harvest, lay, ferment and distil them. Especially learned helplessness has proven an extremely effective means of dressage, particularly in its indirect, socially mediated form: To the end of controlling and stabilizing a status quo, nothing is more powerful than the invisible leash that is formed from the almost instinctive flinching from change that we have developed from frustrated attempts. To braid the invisible leash, it is necessary to create an initial frustration, or worse: a traumatic experience. The use of abasement, physical restraint and violence is unbearably effective at that. These are the knives with which traumata can be cut most directly into the fabric of the self. Alone the realization that these actions are in fact possible and have been applied during every single moment of mankind is deeply frustrating and embarrassing to everyone who has a hope in our propensity for learning. The didactics of helplessness however knows much more subtle techniques, many of which exploit the dependence of the human self-model and self-esteem on the feedback of peers, and the self-evaluation in comparison to what is taught as exemplary by the textbook of the social. The key lesson that an organism needs to learn is one of own incapability: Human identity requires a sense of being in control of matters, such as of the own existence and fate. Make the students of helplessness poor – materially or symbolically; convince them that they are incapable; foster their existential fear; then offer them a straw: They will grasp it and have learnt that it is impossible for them to survive on their own. Give excessive help, function overly, and you shall receive helplessness. The conviction (of an individual or a group) of being out of control needs to get reinforced, practiced and rehearsed. Repeat: We are incapable of dealing with the problem; the problem is overwhelmingly large; it is too complex for our simple minds to grasp; a solution is so improbable that it is impossible for all practical purposes. There is not only one problem: two more get reported every day. We don’t even know enough about the nature of the problems. A conspiracy might be pulling the strings, but there are conflicting theories about who is really, truly in control. No one can know what is going on behind the scenes. In fact, you cannot trust anyone; hence there is no truth. If you can’t convince them of their own helplessness, confuse them and overwhelm them: Immerse them in a constant stream of buzz, whirl their heads around until the liquid between their ears is spinning like an eddy. 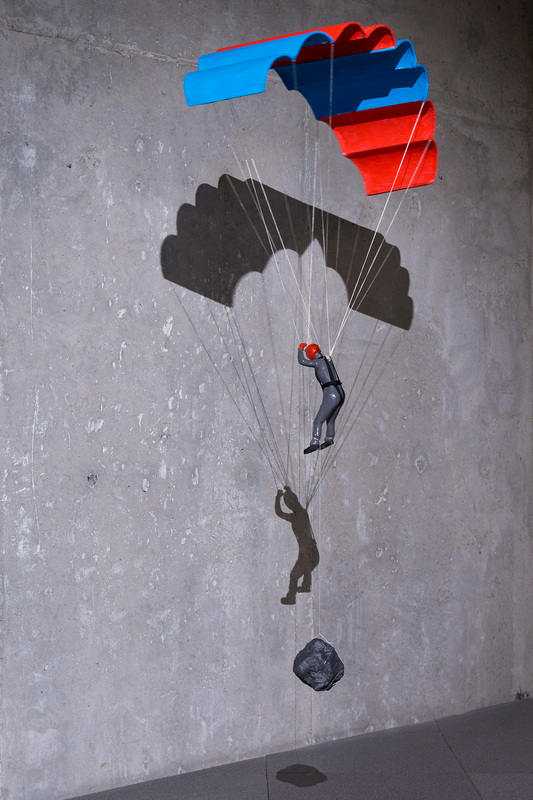 The notion of “learned helplessness” can be summarized as a mental state that an individual or society arrives at when they internalize failure and stop trying to break out of an overpowering condition – even if that condition changes. Put forward by psychologist Martin Seligman in 1967, it has inspired a number of scholars working in the fields of gender politics, racism, genocide, authoritarianism and related subjects that are concerned with the dynamics of hegemony. It is through suppressive education processes, religious and moral principles (enacted both by families as well as institutions and cultures), violations of human rights and freedom, political pressure, and the continuous recall of the status quo by the media, that individuals and societies arrive at a fatal conclusion: That they do not have the necessary power to change the existing modus vivendi or the prevailing regimes. The existing control mechanisms instrumentalise this aspect of human psychology in the form of social engineering and manipulation of societies. They employ the media, prisons, surveillance and security systems that operate on the basis of social psychology. They systematically manufacture a collective sense of helplessness. By using information overflow, normalizing corruption and injustice, monitoring privacy, manipulating law, operating a police system, applying psychological and physical violence, murdering, torturing, imprisoning, creating conflicts within societies, raising poverty and creating a financial need for their own existence, the ruling powers aggressively develop a system of even greater control. In many of the so-called democratic countries of present day, large parts of society are reluctant about available alternatives in elections. Fewer and fewer people feel represented in parliaments. Often people think that their participation will not matter, given the strategies and games taking place in the election systems: Today, in many countries the notion of “free choice” has to be regarded an impossible dream. “The lesser of two evils”, “strategic voting”, or “voting grudgingly” are frequently heard utterances that give evidence of the lost hope. Experiences of violence – massacres, military coup d’états, unsolved political murders, wars, terror attacks, etc. – are severe traumata in the collective memories of societies. They increasingly help cultivate a collective fear and justify the necessity for surveillance, as well as military and security forces. However, these comprehensible needs transform the role of the state from governing to ruling. This is where the abuse of power starts, and the security forces, media and monitoring agencies, which owe their existence to the collective anxiety, start functioning as tools for the defence of the ruling regime from its own public. It is through violence and an overflow of conflicting information that a society gets confused, loses its trust, and consequently its hope. Is it possible to un-learn helplessness? 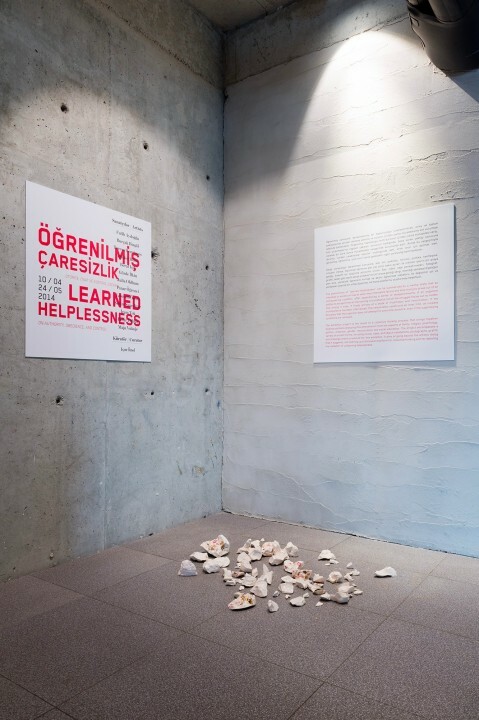 The exhibition project “Learned Helplessness: On Authority, Obedience, and Control” is the result of a collective thinking process about this question. It brings together diverse positions analysing the phenomenon from the aspects of family, religion, psychology, politics, urbanism, gender, neuroscience and social education. 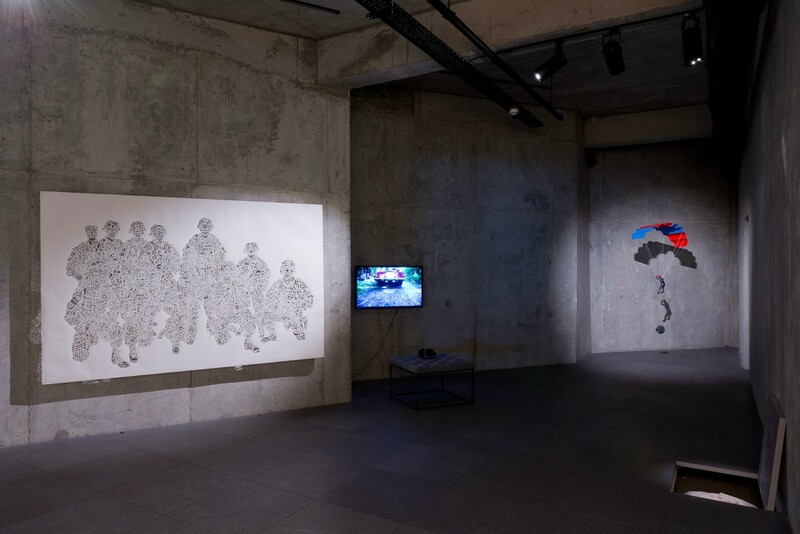 The project encompasses a variety of artistic forms, including sound, video, object installations, photographs, graffiti and drawings – mainly produced for this exhibition. It aims at going beyond the artistic dialog that it suggests, and opening up a discussion platform for collective thinking and for debating the metaphor of unlearning helplessness. Fatih Aydoğdu’s installation Internal Affairs has been produced specifically for the exhibition, concerned deeply about the current and intensive political agenda mainly in Turkey, occupied with elections, corruptions, demonstrations, governmental blunders and secrets. It deals with the notion of collective helplessness and the ways in which the latter is systematically cultivated using the education tools of governing structures that lost their social functionalities. 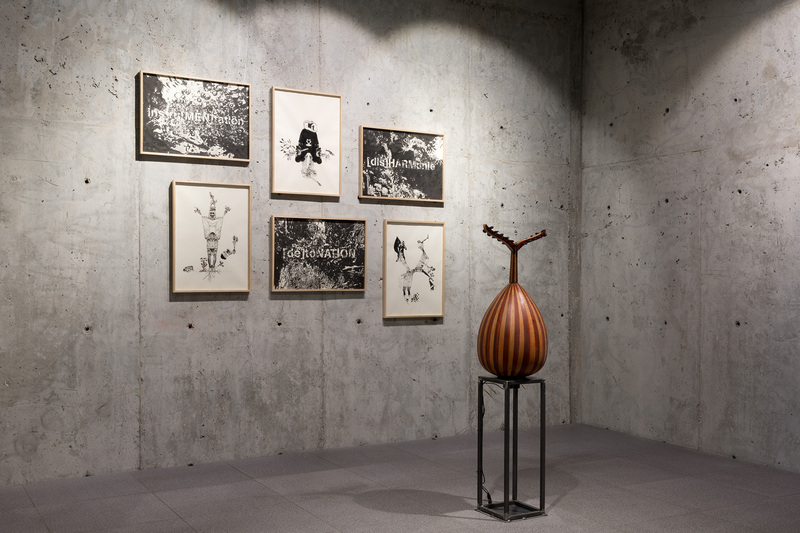 The core of the installation is a musical instrument that metaphorically questions the hegemonic structures and the helplessness taught by them. Two identical musical instruments come together and mirror each other so closely that their conversation paradoxically becomes impossible: They lose their purpose by being occupied with internal affairs. A number of drawings use music terminology to refer to this dysfunction of the system, which causes ultimate helplessness. Burçak Bingöl’s Broken attempts to take a step beyond failure: She takes back the products of the mistake, accident, if not disaster, and treats them as a product of success, twisting the results of a failure into fruitfully existing, resisting objects. Barbie Blues however illustrates the frustration of gender mainstreaming approaches by using a ceramic reproduction of the infamous Barbie doll: She reminds us that there is a long and knotted history of instrumentalization of the female body. With its utopic, anatomically impossible body, the Barbie doll is a symbol of the frustration with inaccessible beauty that children experience wherever the doll has appeared from the 60s onwards. 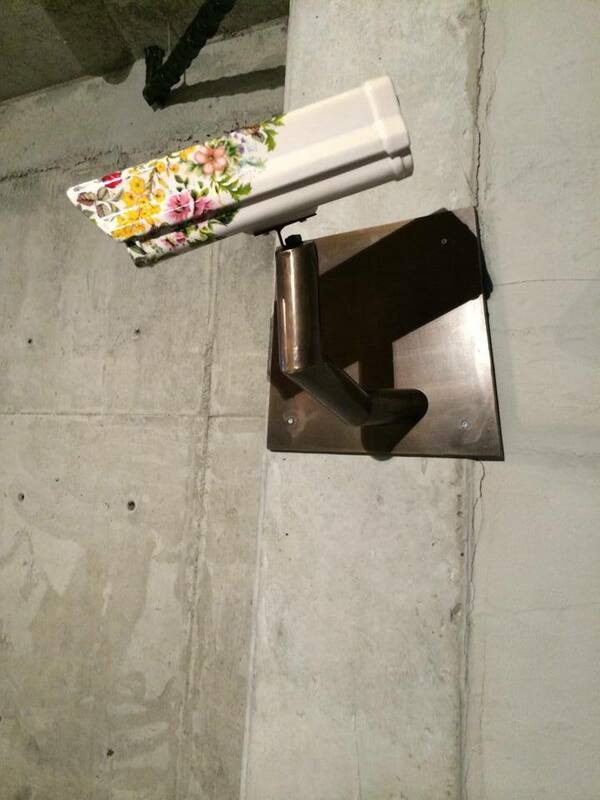 The ceramic reproduction of a security camera, Follower, transmutes an object of observation into one of desire. It is positioned just as unobtrusively as a security camera would normally be placed in an exhibition space. Most security cameras are only invisible because of their omnipresence, which normalizes them and makes them forgotten, although they are very large and not well hidden. On the contrary, their existence reminds the individuals of the omnipresence of monitoring and control, and therefore they quite intentionally are left visible. In fact, the impact of their visibility is stronger than their functionality as recording devices. Bingöl’s reproduction of the functionless but decorated camera deals with this dilemma. With her kinetic sculpture Wings, Teresa Henriques poetically creates a paradoxical figure that is designed to fly but will never be able to do so. The two vulnerable wings attached to a crank rod, can only be fluttered by an external stimulation, and are the reminders of its anguish for an impossible take off. It is a monument of frustration, struggle, and despair to survive inside of limiting, prearranged conditions. Olivier Hölzl’s work primarily explores the dynamics of power mechanisms and poses questions about how the institutions of family, school and the military participate in the process of internalizing power structures. His book and video with the common title Turning Point offer an analysis of family structures, symbolic learning, religion, and power. 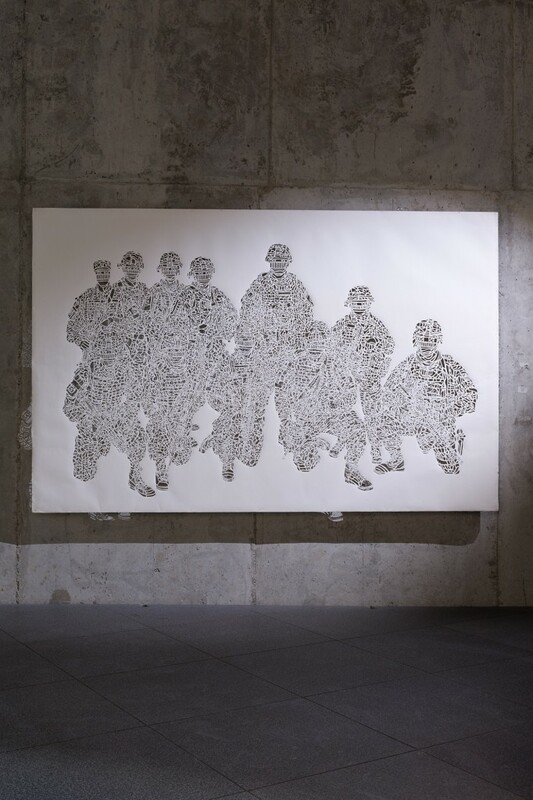 The Point of Impact shows a group of anonymous soldiers without giving a reference to their countries or missions. The military is one of the main institutions that are widely recognized and respected in almost every country. Its existence persistently reminds us of the possibility of war. For countries in transformation, where the military service is obligatory at least for the male half of the society, the army is overwhelmingly dominant both for those who serve in it as well as those outside of it. Berat Işık competently represents the phenomenon of frustration with his video Butterfly Effect. Many faces of anonymous people are seen who hold their breath in an absurd way, thus getting transformed into weird creatures – reminding somewhat of Kafka’s Metamorphosis. They wait patiently until they cannot hold their breath anymore. In this video, we indeed witness a change of facial expressions that occurs shortly before death – which would set in if the actors would not stop holding their breath at the last possible moment. 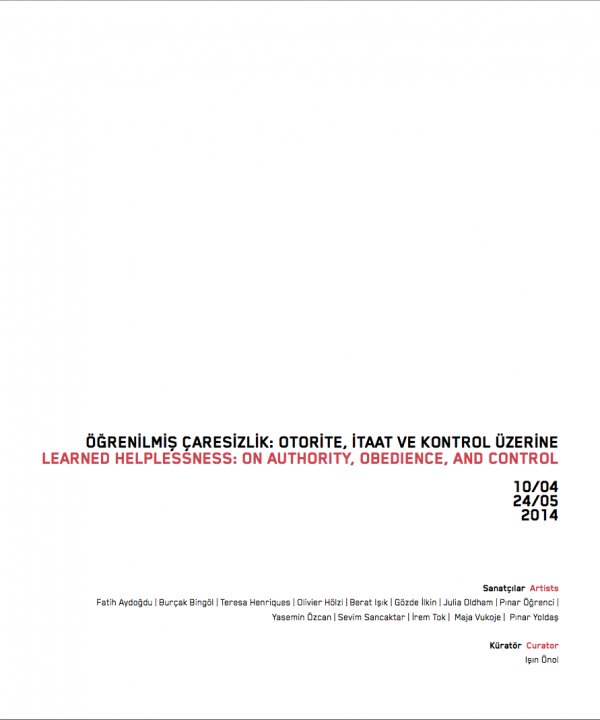 Gözde İlkin’s work primarily deals with power struggles in society and families. Her work Dream: There is no place to run away on the one hand deals with domestic violence and the helplessness of the victim, which is even unable to run away. At the same time, it reminds us of the collectively shared feelings about home (in the sense of a country), where things are complicated, the level of poverty is high, living conditions are problematic, human life is under threat, the notions of democracy, equality, human rights and freedom are challenged, and the citizens are not free to travel. Julia Oldham constructs stories predominantly inspired by physics and math. The film Circuit however is different from her physics-based work: It has more of a narrative attitude, showing a young woman who repeatedly finds herself getting locked into in the trunk of a car in the woods. The character is trapped; she does not question the situation she is in, but just struggles to survive within it. Bleeding was produced at about the same time, and has a similar background: A cycle of creepy events occurs continuously, while the main character develops her own way of living through the pain and danger, without running away from it. Rather, she accepts that the timeline around her is skewed. 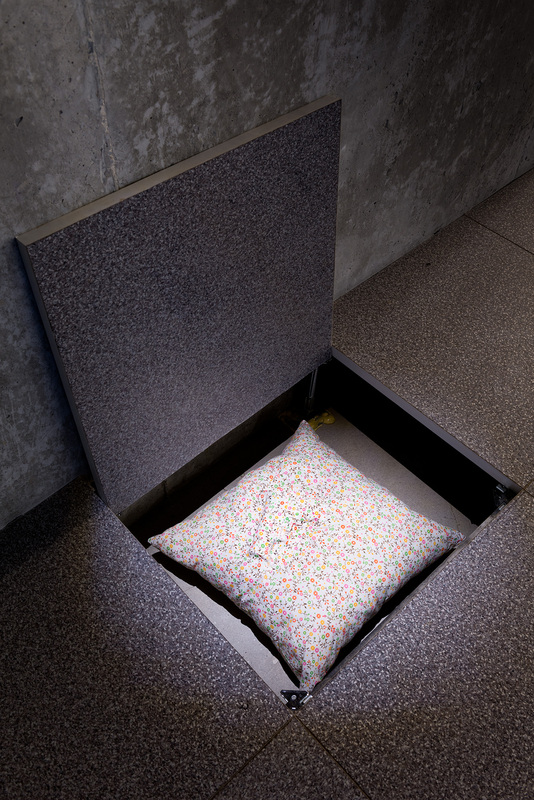 Having studied architecture Pınar Öğrenci is deeply concerned with transformation of urban and architectural space. 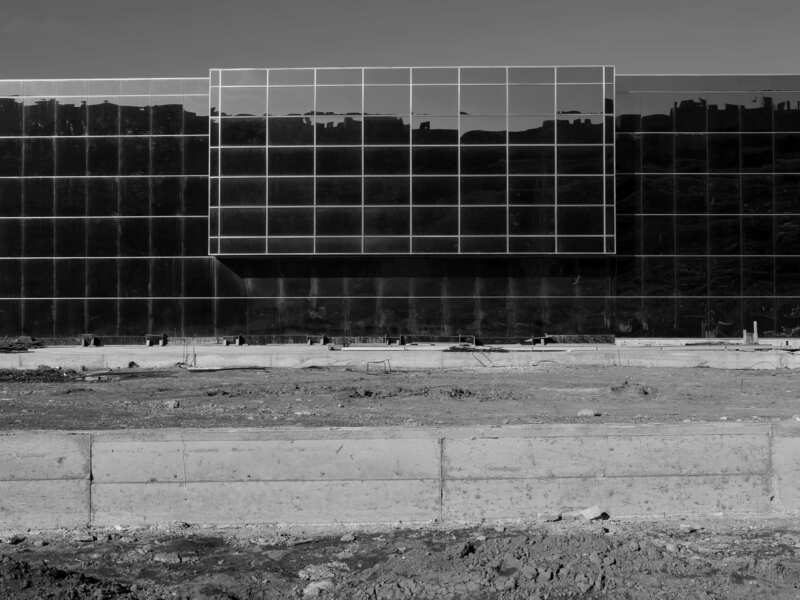 The video piece Collapsing New Buildings consists of double channel videos produced between 2011 (Hamburg) and 2013 (İstanbul). First one (Hamburg) shows a construction site hidden behind a wooden fence, with a number of carefully placed holes for the passers-by to be able to view the progress. It is the construction site of an IKEA outlet in Hamburg, built in the lieu of a 1960s shopping mall that had been abandoned in 1990s, occupied by artists, and then eventually demolished to make place for IKEA. The second video shows a similar view, but this time in Istanbul, 2013. It shows a similar fenced construction site within the ‘Taksim Pedestrianization Project’, which triggered the Gezi Park movement. 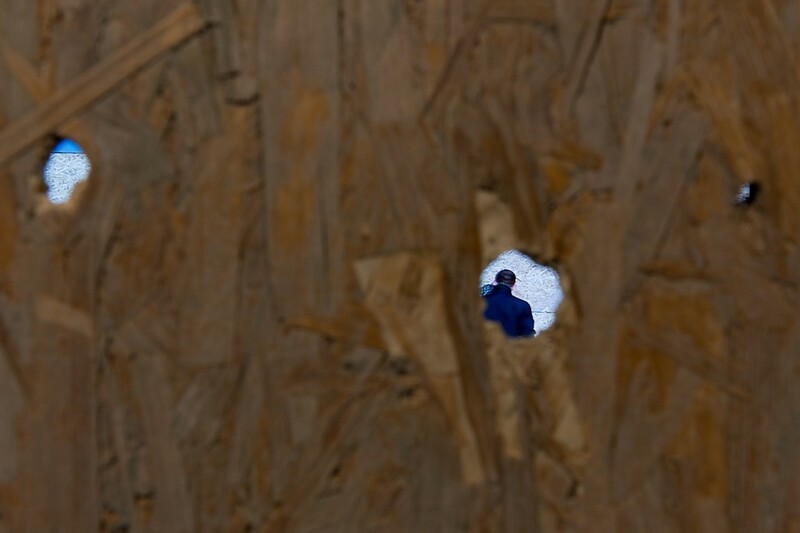 This time we see randomly placed holes in the wooden wall, created by citizens in order to be able to observe the on-going project – their opinion about it had never been considered. 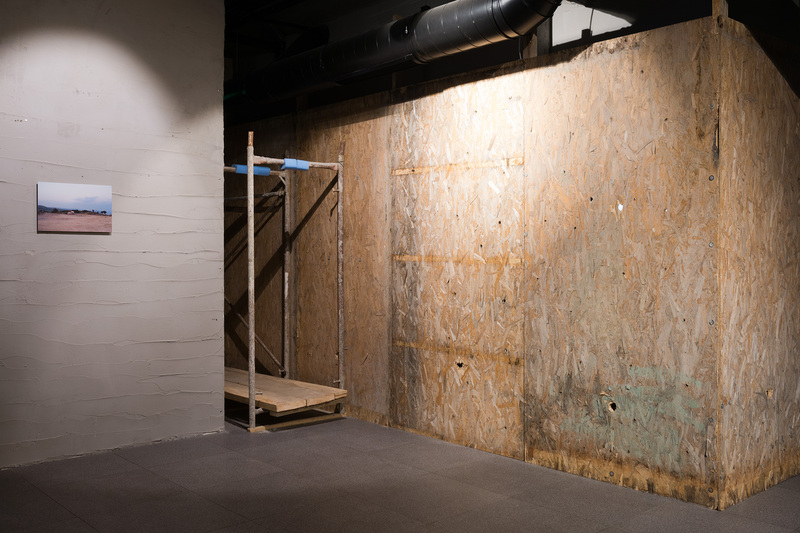 The installation that Öğrenci constructs at the gallery corridor stages a similar setting for observation, inviting the viewer to question the notion of ‘watching’. 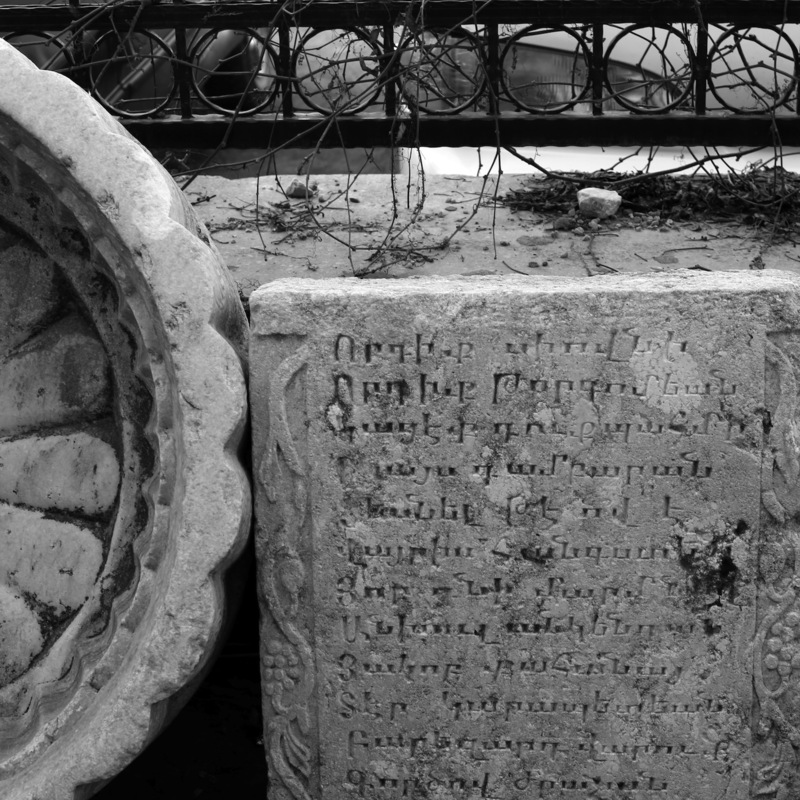 Öğrenci also shows an installation entitled The Evolution of the Sacred, which consists photographs and a video. The series concentrates on the Museum of Van, which was built in 1974. An ancient city, apart from hosting many civilizations, Van was also the capital of the Urartu Kingdom in the Armenian Highlands, and therefore contains many archaeological remnants. The city, which constitutes a basis for the personal history of the artist, has been forced violently to expand by the city development projects. A primary school next to the museum – where the artist had studied – was demolished in 2010 to make place for a shopping mall. The museum will be moved into their new premise that is newly built right in front of the historical castle within a supposedly protected area where construction is forbidden. 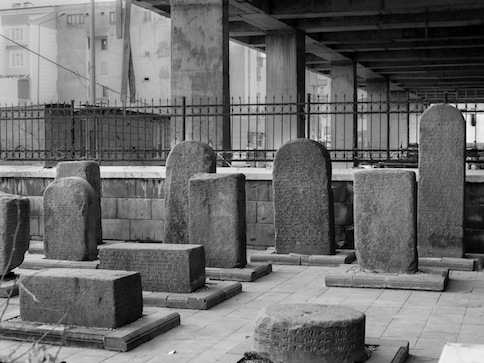 At the video entitled The Evolution of Sacred: Stone and Iron, Öğrenci suggests a solidarity with the city, whose capacity is challenged, by symbolically erasing the iron bars raising from the construction site. The installation highlights the sad absurdity of this mode of urban development by juxtaposing cheap glass buildings with the castle and the steles of the ancient cemetery with a construction site, among others. Produced for the exhibition, Learned Helplessness, Yasemin Özcan’s, video work, as well as a photograph with the same title, Ashore is an installation that remarks on an impasse in the political landscape of Turkey. The boat run aground is a surreal representation of the perpetual problems whose solution the geography awaits. It is a criticism of the position that, instead of analyzing the ongoing conditions and confronting them, constantly searches for the cause of the problem outside. 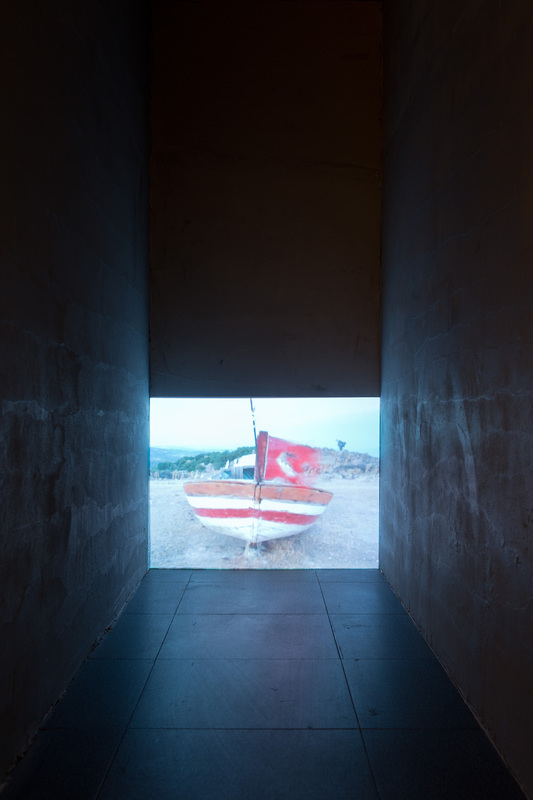 Özcan constructs this boat, which she incidentally encountered meters above the sea level, as a metaphor for a country that has dried out the water that carried it, the life that surrounded it, and the different identities that inhabited it, dragging those who remain to a hopeless situation. Ashore shows a boat all alone, at an unknown, albeit an undoubtedly wrong place. With its damaged flag, the boat resists transformation while continues to wait for a solution to its irrational conditions. 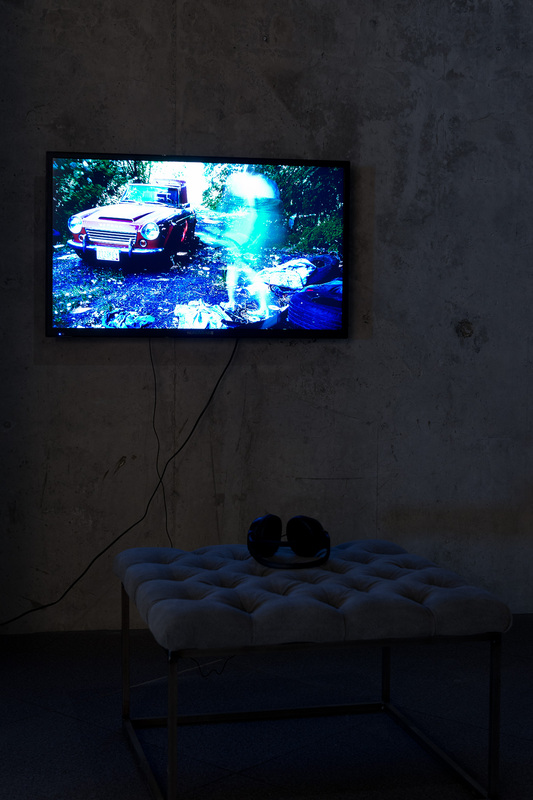 Sevim Sancaktar’s installation Inferno 00:00 consists of several layers of information that deal with individual and urban memories that are under constant bombardment with images. She focuses on the dynamics of normalization processes of as well as the connection between perception and memory. Sancaktar collects numerous sound and video recordings mainly from celebrations/explosions, as well as images from news, and connects them with a person who is following a screen saver animation without any reaction, creating a unique environment, dealing with the notion of memory and its constructed ‘hell’ within life. Borrowing the title Inferno from Dante’s Divine Comedy, she studies how the astonishing effect of conflicting images and information gets normalized, internalized and becomes part of the collective memory, throughout history. 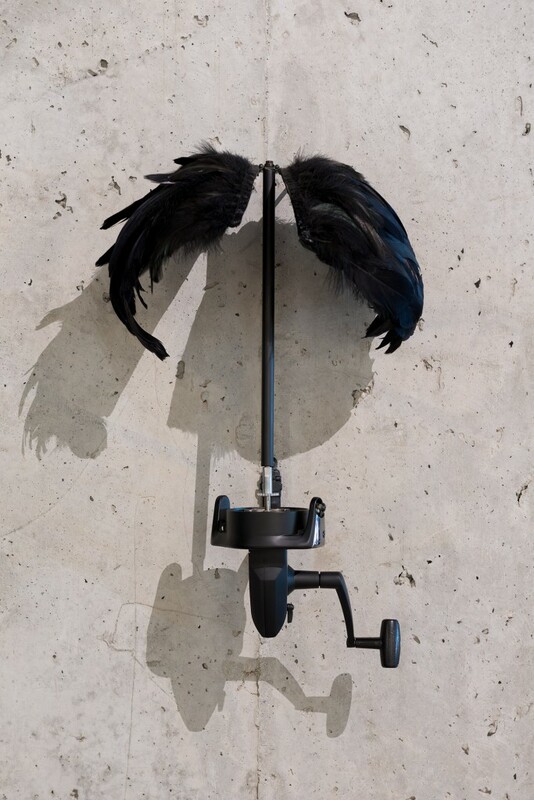 There are two objects by İrem Tok in the exhibition: Parachute is stuck between being a device for landing safely when necessary, and one for evoking pleasure and unforgettable experiences. It neither provides the fun, nor the safety, but only despair, embarrassment, and failure. A failure between flying and landing: getting stuck in an unknown state. 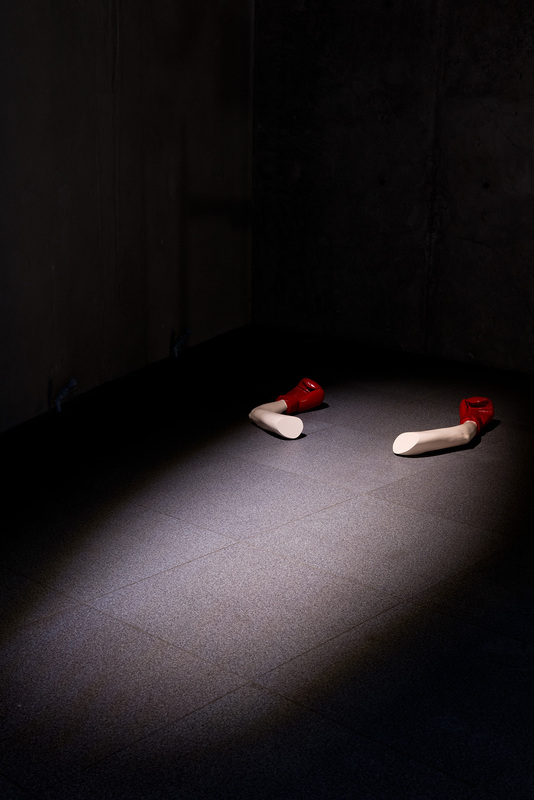 Knockout implies a condition of failure, which ends before having begun: a pair of life-sized, feeble-looking arms – albeit well equipped for struggle and resistance – find themselves involved in a fight, although already having been defeated. The work intensely represents vulnerability and struggle at the same time, by pointing at the paradoxical act of fighting to lose. In this work, the prevailing condition of being knocked out is not the end, but rather a starting point: It suggests going back to a failure, and starting from there again. Maja Vukoje’s drawings are based on her personal memories. Deviating from her usual practices of painting – which involve considerably detailed labour and a realistic approach – her drawings are based on simplicity and abstraction. This creates a childish and cartoon-like impression, introduces a distance from reality, while delicately touching upon the residues of her own intimate privacy. 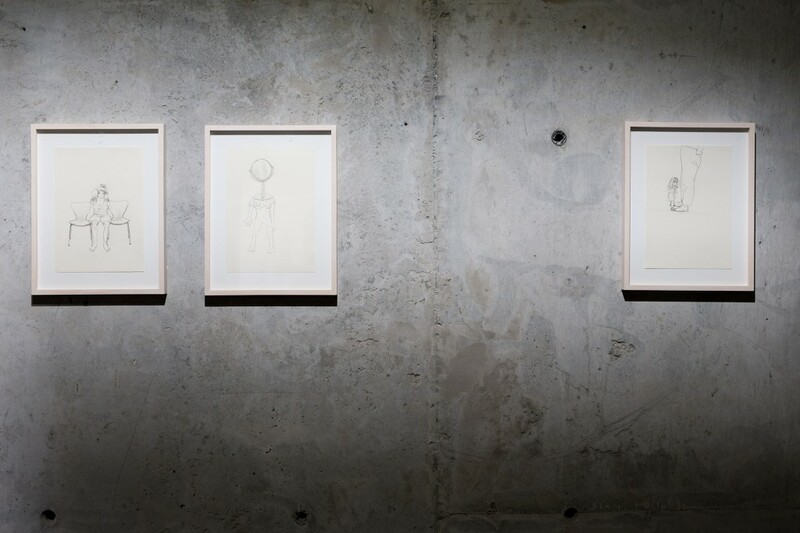 Produced between 2010 and 2011, the three drawings in the exhibition share a similar style, and in all of them we encounter the impact of an education to kindness, politeness, empathy, sensitivity, gentleness, and tenderness on the young female body. It is not only through violence and torture, but also through the education to empathy and other seemingly positive traits, that may build the invisible borders that an individual feels imprisoned by. 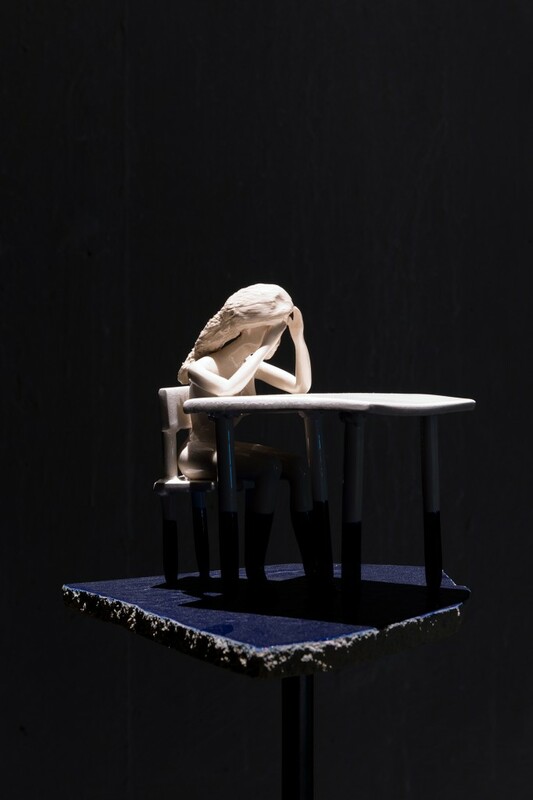 Pınar Yoldaş’ multimedia sculptures clearly show the impact of her art & science doctoral research in neuroscience that she has been pursuing for the past years at the University of Durham. The notion of “learned helplessness” is also of interest for neuroscience, as well as for psychology and social studies. Yoldas produced a number of new works, inspired by the concept of the exhibition. NeoLabium can be understood as a reaction to the suppression of female sexuality. 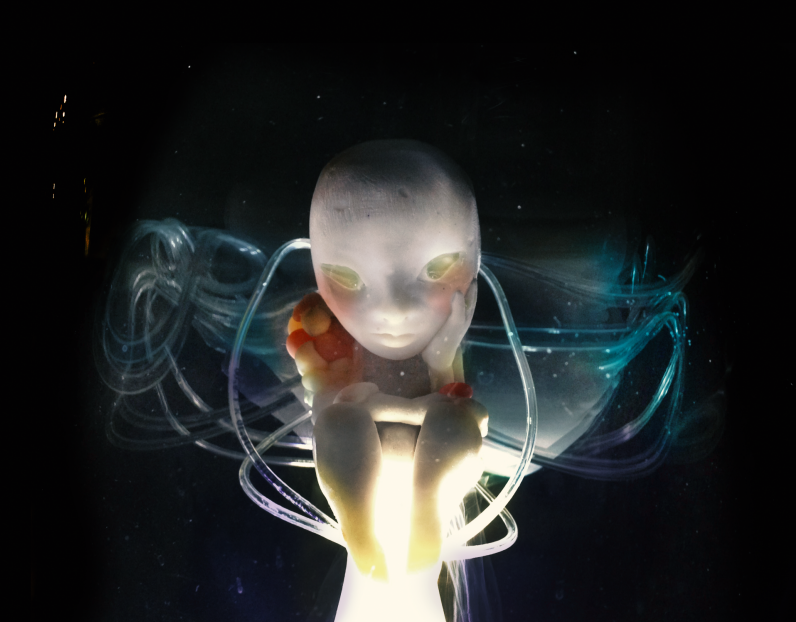 Yoldas creates a fantastic, utopic intersexual organ that originates from a combination of biological imagination and post-human feminist phantasy. A drawing with the same title illustrates the metabolic and physiological functions. 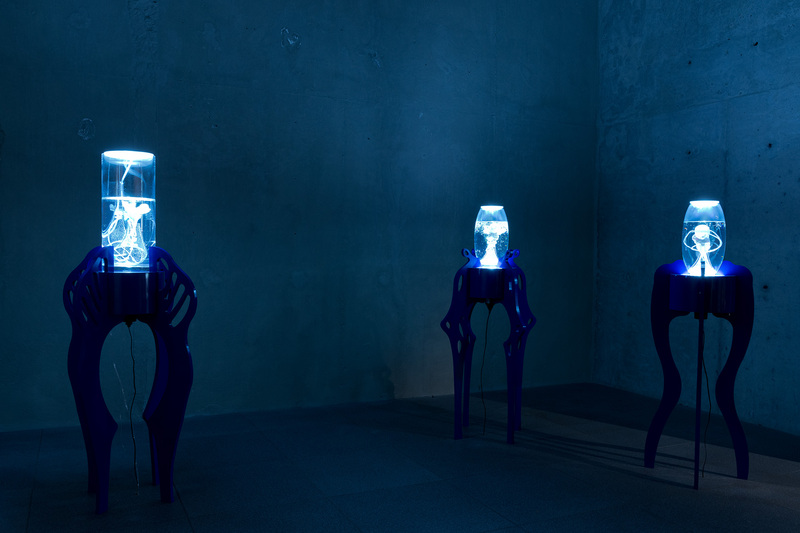 From her series Remembering the Future, two pieces are shown in the exhibition: Cassandra and Chronos. They depart from the notions of memory and future and directly reference the phenomenon of Learned Helplessness. The two eponymous characters are borrowed from mythology: Cassandra represents suppressed truth, whereas Chronos is known for eating his children in order to prevent them from murdering him. From a neurobiological aspect, learned helplessness is related to implicit and motor memories. To learn helplessness, one’s emotional system has to be educated with pain, which is particularly effective at provoking learning and memory formation. The characters that Yoldaş studies and reproduces are able to remember every emotion they have experienced and to use that memory to anticipate the future. By analogy, societies that lack a collective memory cannot actively create their future. Fatih Aydoğdu was born in 1963 in Turkey. He studied at the Academy of Fine Arts in Istanbul and graduated from Academy of Fine Arts in Vienna. Aydoğdu is conceptual, visual & media artist, designer, sound artist and curator, focused on concepts of media aesthetics, migration & politics of Identity and linguistic issues. 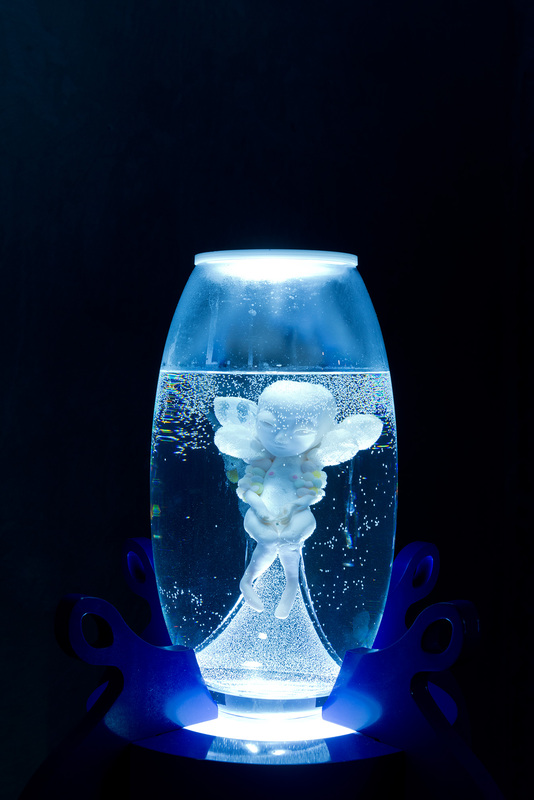 He took part at numerous exhibitions throughout Europe, Asia and USA. Aydoğdu lives and works in Vienna and Istanbul & he is a member of curatorial board of ‘amberPlatform‘ Istanbul. Burçak Bingöl (1976-Görele, TR), lives and works in Istanbul. After completing the primary education in Ankara, she graduated from BA, MA, and PhD programs respectively in 2000, 2002, and 2008 from Faculty of Fine Arts, Hacettepe University, Ankara, Turkey. Additionally, she graduated from Department of Choir, Ankara State Conservatory where se studied between 1985-91; and a program on Photography in The New School, New York in 2009. Throughout the PhD program she worked as a research assistant in the Department of Ceramics. Teresa Henriques (born 1978, Lisbon, Portugal) is a Rooster Gallery represented artist. She holds a MFA in Fine Arts by the School of Visual Arts of New York (2010). She did the Location One residency in New York (2006/07). She was awarded two times grants from Calouste Gulbenkian Fundation and Luso-American Foundation (2008-10) (2006-07). Henriques last solo exhibits were “Prospective” and “Problem,” Rooster Gallery, NY (2014, 2011), “Use the Resources”, Pedro Oliveira Gallery, Porto (2010) and “Aleatograph” Sala do Veado, Museum of Natural History, Lisbon (2008). 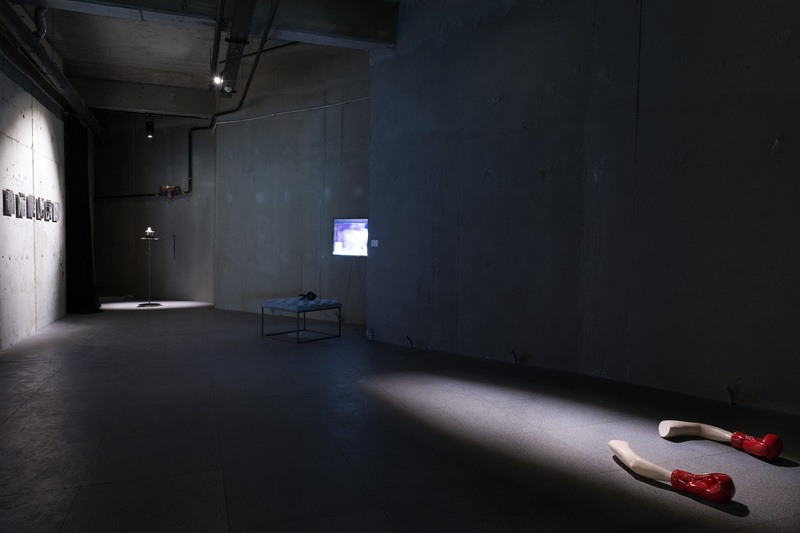 She has shown at Perry Rubenstein Gallery (“Plus One,” curated by Dan Cameron), and SVA Gallery (“Thanks… but it`s actually on purpose,” curated by Augusto Arbizo) in New York, Modern Art Center of the Gulbenkian Foundation in Lisbon, Galeria Pedro Oliveira in Oporto and Galeria Sete (“13:7,” curated by Miguel Amado) in Coimbra. Olivier Hölzl’s s work is characterized by the combination of image and text, the immanent, associative richness of which the artist exploits to the fullest. Starting point of LIVIL’s work are often a group photos depicting individuals in a family, in a company or other such social setting. Berat Işık, an artist of Kurdish origin, was born in 1976 in Diyarbakır, in the south-eastern region of Turkey, where a large Kurdish community is based. After studying painting at the University of Dicle, he started work as an art teacher at the secondary schools of his region, alongside his artistic activity. 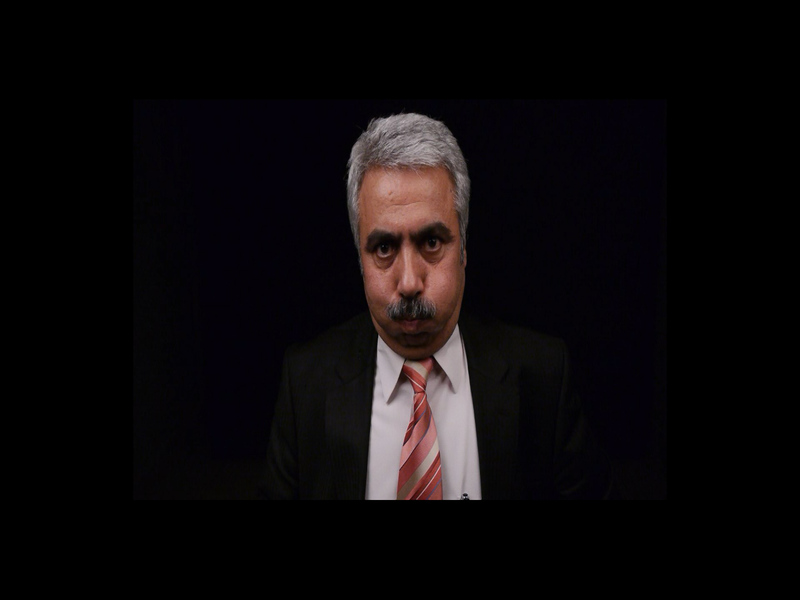 Berat Işık’s videos are often underpinned with black humour, questioning the influence of popular culture on the collective memory. He views contemporary society with a critical eye and highlights the sensitive position in which the minorities in Turkey finds themselves. As though refusing the hegemony of the industry that imposes an aesthetic that is too picture-perfect, Işık does not correct certain technical “flaws” in his videos. These elements intentionally left on the tapes highlight the resistance that the artist manifests against the micro managing of culture, as well as the urgency and necessity with which these works are produced. Gözde Ilkin is an artist who uses stitching, drawing and painting in her works as techniques to form her installations. Her works derive from different daily materials that reflect and are identical to problems to the social and political atmosphere. She works with accumulated things, images, stories, photographs, objects and fabrics that help describe particular situations that she is interested in. Gözde İlkin was born in Kütahya, Turkey in 1981. She studied painting at the Fine Arts Faculty of Mimar Sinan University and got her master’s degree at Marmara University in Istanbul. She has taken part in international artist exchange programs in the Netherlands and Germany and in exhibitions in several centres, including Stockholm, Rotterdam, New York, Berlin, Paris, Munich and Belgrade. In Turkey, her works have been displayed in many venues, such as Istanbul Modern Museum, Siemens Sanat, Hafriyat, Karşı Sanat, and Tobacco Warehouse. 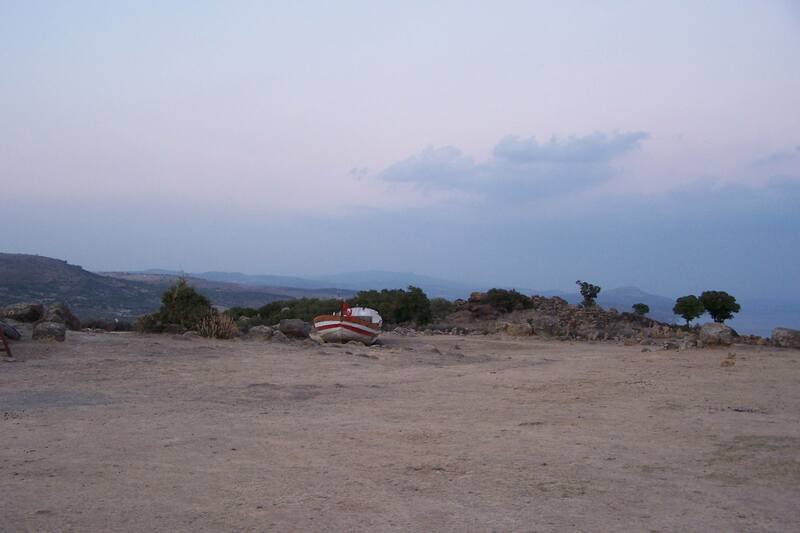 She was a member of the artist initiative “Atıl Kunst” between 2006-2013. Gözde İlkin lives and works in Istanbul and represented by artSümer. Julia Oldham weaves stories out of the complexities of physics and math, the mating dances of insects, and chance encounters with wild animals in the forest. Casting herself in the role of lover, wanderer and scientist, she creates a mythology with her videos, drawings and songs. Oldham was raised by a physicist, an avid gardener and a pack of dogs in rural Maryland, and her childhood was filled with adventures in the woods, bee stings, drawings, and science experiments. Oldham studied art history at St. Mary’s College of Maryland and then received her MFA from the University of Chicago. She spends her time in New York and Oregon. Pınar Öğrenci (b. 1973, Van) residing in İstanbul has a degree on architecture from Yıldız Technical University and master degree on restoration from the same university. She has transformed her architecture office MARS into an independent art space for exhibitions on architectural research and has been invited as guest artist to Frise-Hamburg, Willa Waldberta-Münih ve Altonale Fest-Hamburg programs. The artist’s critiques on art and architecture have been released in publications such as Arredemento Mimarlık, İstanbul, XXI, Ahşap, Natura, Agos, Arkitera and her research has been included in books titled ‘Ottoman Architecture, Late Period’ and ‘Anatolia Moderna’. Her work has been on show in Santral İstanbul as a part of ‘1910-2010 İstanbul’ exhibition and referred to in seminars held in French Institute for Research on Anatolia and Studio X Istanbul. 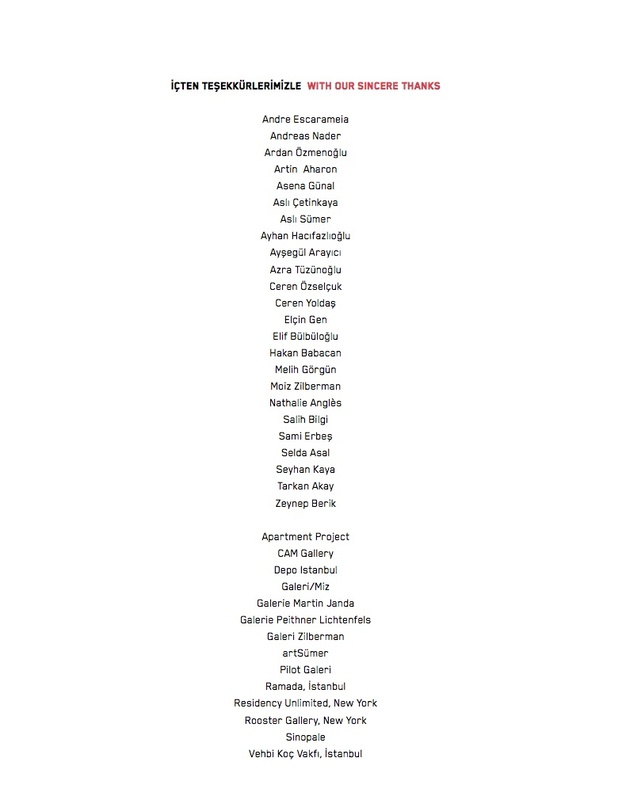 Pınar Öğrenci, who has curated Crystal City, Utopia Collection and Unfounded exhibitions in Istanbul, has been invited to CIMAM conference held in Rio de Janeiro in 2013. 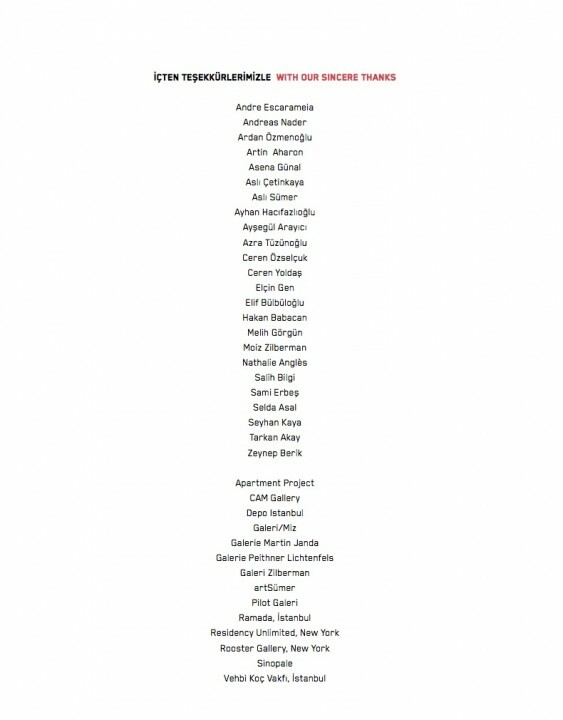 Öğrenci has realized her first solo exhibition within Altonale-Fest guest artist program and has taken part in expositions such as Die Neu Eröffnung (Halle10,Münih), Floating Volumes (Frise-Hamburg/5533-İstanbul), Reality Terror (Depo, İstanbul) and Soft City (Alan İstanbul). 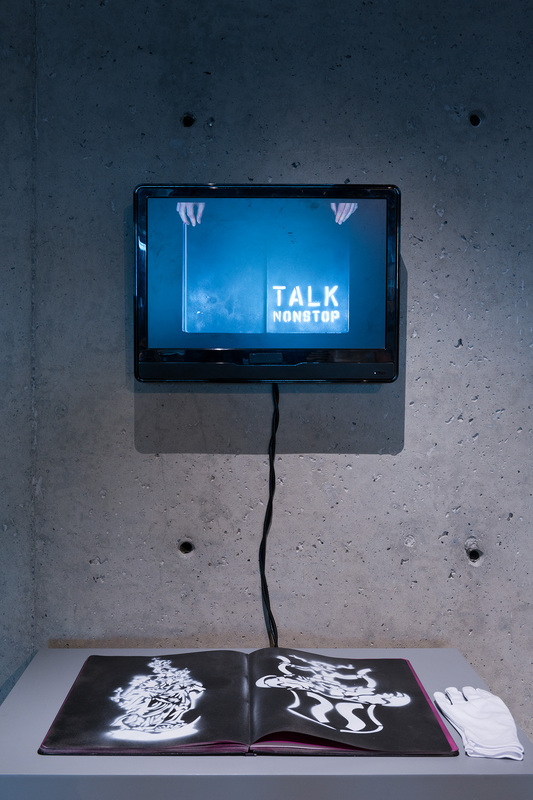 Öğrenci believes that art production, writing, research and curatorial works are all interlaced forms of expression and she is currently working as the director of independent art initiative MARS which she has founded. Yasemin Özcan (b.1974, İstanbul) lives and works in İstanbul. Recent group exhibitions include What is it that you’re worried about? RODEO Istanbul (2014), Giving Form to the Impatience of Liberty, WKV-Stuttgart (2013), Unrest of Form/Imagining the Political Subject Secession, Vienna (2013), D-0 ARK Underground Biennale, Bosnia and Herzegovina (2013), Sail Away, We Must! CDA Projects, Istanbul (2013), Turkish Art New and Superb, Tanas, Berlin (2013), Kayısı Kent A4, Depo, Istanbul (2011), İkinci sergi, Arter, İstanbul (2010), Tabiatım Bu! 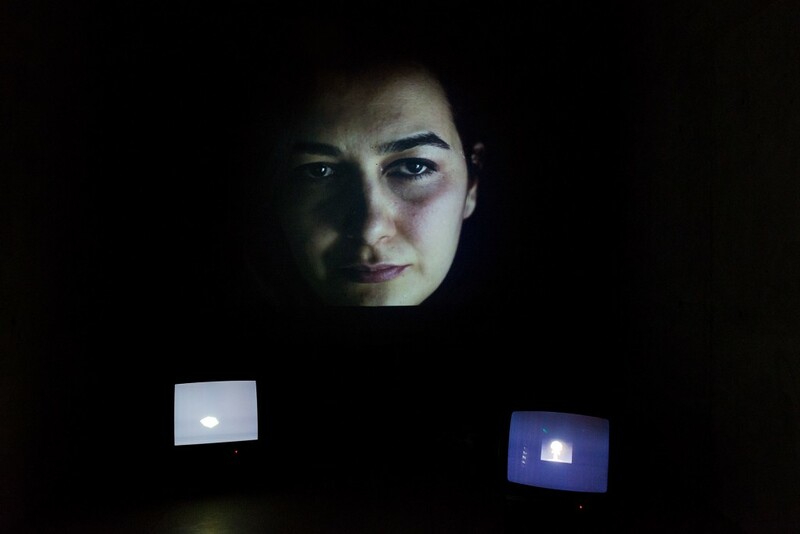 Kasa Galeri, İstanbul (2010), I am not there, Apex CCS Bard, NY (2010), üçyüzbir, Apartman Projesi, Istanbul (2009), save as Triennale Bovisa (2009), transfer Ludwig Forum Museum, Aachen (2007) and transfer Bochum Museum (2007). She was an artist in residence at Cite des Arts (2012), Can Xalant Center for Contemporary Art (2009) and transfer (2006). Along with Budak Akalın she was the set designer in Poyraz, a nominee at the short film category at the 59th Cannes Film Festival. Born in 1984 in Istanbul. She is represented by C.A.M Gallery Istanbul and she is one of the co-founder of Rec Collective. “The impossible space” REC Collective, HAN38, İstanbul, Eugenio de Almeida Forum, Portugal, Pinacoteca Nacionale, Italy, BM Suma Contemporary Art Centre, Istanbul, Yersiz APART and 5533. Her works have appeared in various publications such as, “New city Reader” (Istanbul Design Bienial), “Indispensible Books” Artist Book Catalogue of Central Pompidou, France “Contemporary Art in Turkey”, Akbank, Turkey, “Ice Magazine”, Turkey, “Middle East Photo, “Image Magazine” France, Salkovic, Artist Book, Rec Collective, Istanbul. Born in Istanbul in 1982, İrem Tok graduated from Marmara University Fine Arts Faculty, Painting Department in 2007. She participated in a number of artist residency programs: Cité des Arts, Paris (2013), Villa Waldberta, Munich (2012), art.homes, Munich (2011), School Gate Project of Incheon Foundation for Art & Culture, South Korea (2010), Litmus Community Space Artist-in-residence program, South Korea (2009), Borusan Art Center, Istanbul (2008). 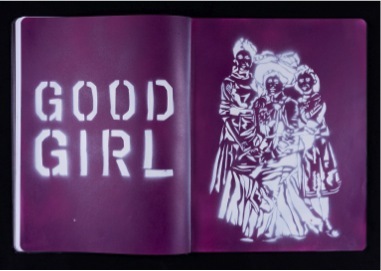 Her first solo exhibition “Fade Away” was held at Outlet Gallery, Istanbul in 2011. Selected group exhibitions include “Signs Taken in Wonder”, MAK Museum, Vienna (2013), “Blur”, Weltraum, Munich (2012), “If the Nature is Heaven, the City is Hell”, CERMODERN, Ankara (2011), “Etats d’Ames” ENSBA, Paris (2010), “Mind Models: the First Show”, Borusan Music and Art Center, Istanbul (2010), “Be Realist, Demand the Impossible”, Karşı Sanat, Istanbul (2007). Irem Tok lives and works in Istanbul and represented by Pilot Galeri. In her large format paintings Maja Vukoje addresses discursive issues such as postcolonialism, gender, and popular culture. Her work is characterized by an artistic language operating on the highest level that exploits all the possibilities of painting. The wealth of pictorial forms of expression created by the use of combs, putty knives, stencils, flowing paint, sprayed elements, and applications of real objects finds its counterpart in the somewhat undecipherable contextual meaning of the images. Maja Vukoje lives and works in Vienna and is represented by Galerie Martin Janda, Vienna. 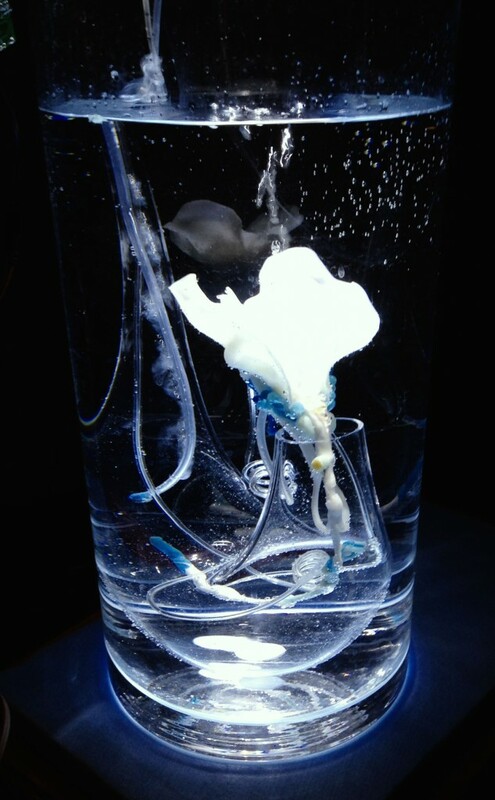 Pinar Yoldas is an award-winning cross-disciplinary artist/theorist, an independent researcher and a neuroenthusiast. Based on her varied background in architecture, interface design, computing and neuroscience she seeks to enhance the transformative power of art through the creation of hybrid art forms, and concurrent use of various media. Pinar has been awarded fellowships in art and science venues including the MacDowell Colony, UCross Foundation, VCCA and National Evolutionary Synthesis Centre. She is the recipient of the Transmediale Villem Flusser Art/Theory Award for her project “an Ecosystem of Excess”. Pinar has a Master of Fine Arts degree from University of California Los Angeles. Currently she is a PhD student in Visual and Media Studies program at Duke University, where she’s pursuing a certificate in the Center for Cognitive Neuroscience. Her academic research interests include bio-art, art-neuroscience interactions and subversive gaming interfaces. Prior to her education in the United States, she has received a Bachelors of Architecture from Middle East Technical University, a Master of Arts from Istanbul Bilgi University and a Master of Science from Istanbul Technical University. She holds a bronze medal in organic chemistry in the National Science Olympics and had her first solo painting exhibition when she was five. Tobias Nöbauer (b. 1980) is a scientist, cultural worker and activist based in Vienna, Austria. He graduated from the University of Vienna and TU Vienna in Physics and Sociology and holds a PhD in experimental quantum information physics from TU Vienna/Vienna Center for Quantum Science and Technology (Complex Quantum Systems Program). He currently is a postdoctoral researcher in neuroscience at the Research Institute of Molecular Pathology (IMP), Vienna and a member of the research platform “Quantum phenomena and nanoscale biological systems”. He has worked at the European accelerator lab CERN in Geneva, Switzerland, and published on hybrid quantum systems and quantum-enabled sensing. He has co-organized numerous music and multidisciplinary art events and festivals. His recent projects include an online archive on digital culture and politics (transformingfreedom.org) as well as several art-science interactions in the fields of theater, performance and new media (Garage X, Vienna; Tanzquartier, Vienna). He has taught workshops on science studies for natural scientists. He cares about the politics of technology, communicates about the aesthetics and philosophy of quantum mechanics, and wonders about the co-emergence of science and society. Isin Önol (1977, Turkey) is a curator based in Vienna. She is a PhD Candidate at the Department of Cultural Studies, University of Applied Arts, Vienna, Austria. 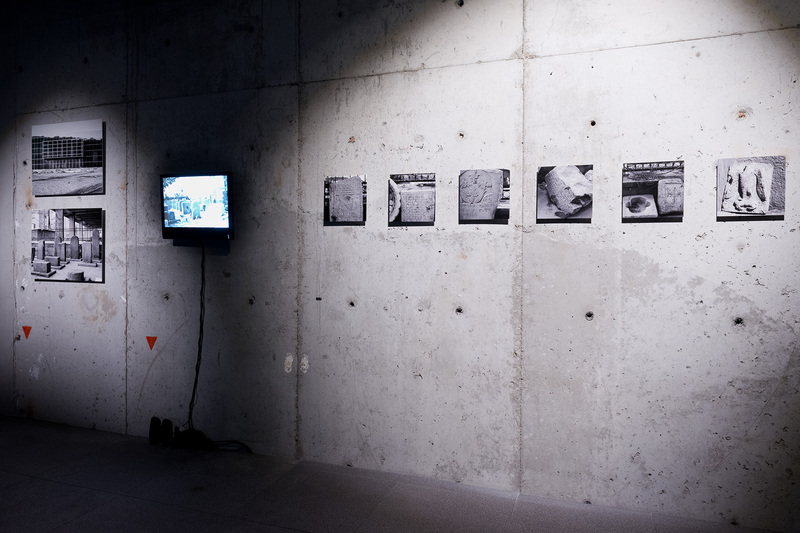 She has completed her Master of Advance Studies on Curating at ZHdK, Zürcher Hochschule der Kunst, Zürich, Switzerland (2009-2011). She participated to Ecole du Magasin, International Curatorial Training Programme, Centre National d’Art Contemporain, Grenoble, France (2009-10) and Gwangju Biennale International Curator Course, Gwangju, South Korea (2009). She received her MFA on Visual Arts and Visual Communication Design from Sabanci University (2003), and her BA on Art Education from Marmara University (2000), Istanbul, Turkey. After working as the art coordinator at Bosporus International Schools, Istanbul (2003-2006), she worked as the project manager/director and curator of Proje4L/Elgiz Museum of Contemporary Art, Istanbul from 2006 to 2009. At this space, besides curating shows with selections from the museum collection, she functioned as the project manager of numerous international exhibitions. Beside that she has curated number of exhibitions with emerging artists at the project room of the museum. Independently she has curated/co-curated the following shows.